The idea of having a bar or pub in the home is one that appeals to a lot of people all over the world. It is also an excellent home improvement project for those who enjoy DIY. The idea of a South Seas island-style tiki bar is a bit more specific than a general "bar" both in terms of design and style. While these may be built indoors, tiki bars are particularly popular for patios, decks and gardens, especially alongside pools, where they immediately raise the appeal and versatility of outdoor entertaining. While you can have a custom-made tiki bar made and installed for you, or buy a prefabricated tiki bar and install it yourself, the other option is to build tiki bar elements from scratch. The traditional material used for tiki bars and tiki huts is bamboo – normally big, fat stems. The roof is usually made with thatch (with bamboo forming beams), which provides protection from the sun and rain. However you could create a reasonably authentic look by using thin bamboo or even river reeds for the roof. Better still, line the thatched roof with bamboo to create a ceiling effect and lots more protection. A particularly good material for the bar surface is marine ply which you could top with a split bamboo overlay, or even bamboo floorboards. If you are locating your tiki bar on a covered patio, you could simply use palm leaves to give the general idea of an island pub. The palapa bears some resemblance to the traditional tiki bar, but it is usually made with timber poles that support a thatch-like roof that is more usually made with palm leaves (rather than thatching grass). An import from tropical venues, the palapa-type structure is often found at resorts where they incorporate commercial bars or tables where food can be served. So mix and match depending on the materials you can easily get. Bamboo and thatched tiki bars were discovered by American and European travelers who holidayed on "South Sea" islands (more specifically Polynesia) in the first half of the 20th century. A few American entrepreneurs thought the idea was great for bars, nightclubs and restaurants with a Pacific flavor. As a result these tiki bars became famous for the cocktails served at each and every one. Perhaps the most famous was Don the Beachcomber, originally launched by Ernest Gantt in Los Angeles in the 1930s. He served exotic rum-based drinks along with Cantonese food in the original tiki bar that was decorated with genuine items he had collected while travelling in the so-called South Seas. When Gantt went to war in the 1940s, his wife managed to expand Don the Beachcomber into a hugely successful chain of 160 establishments. The other was Trader Vic's established by Victor Bergeron in California in 1936. 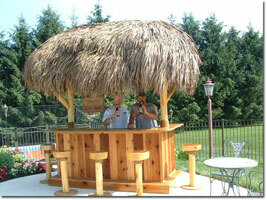 He succeeded in expanding his tiki bar business all over the world. Tiki bars flourished in America until the 1960s, but then seemed to lose favor. More recently however they are making a comeback, not just commercially but in private homes as well. 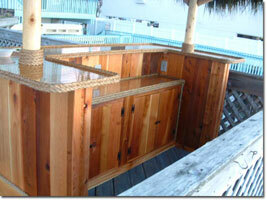 The size of a bamboo tiki bar is really personal choice. Some typical (though quite small) prefabricated types measure 6.5 feet by 2.5 feet and are from 7.5 to 8 foot high, which gives enough space for two bar stools or raised chairs on either side of the bar. What you do is to erect the uprights (whether bamboo or wood) and then make a pitched roof that you cover with thatch. Then make the bar surface under your shelter. Easy! Since many tiki bars create their own house specialty drinks, once you've built your own home tiki bar, why not do the same? Then go ahead and have a party luau feast, Hawaiian style. If you see yourself behind the bar with your friends enjoying a Mai Tai or Pina colada it is time to start planning your tiki bar. You can purchase a tiki bar online, but if you want to save money and build the perfect bar, I’ve found a great set of plans by a master tiki builder. Whichever option you choose, you will find that once you have one built in your backyard, all you have to do is invite friends and you'll have an instant party. To learn more about the bar in the picture to the right and and download the plans now, click on plans to build tiki bar.